I admit it, I hate zoos. 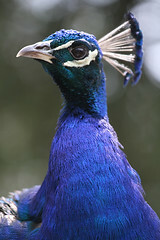 I hate that we take beautiful animals and place them in cages for the public to pay and oogle at. I hate that we breed them, sell them, trade them and act as if that is what will preserve their species. But I heard that the Folsom Sanctuary/Zoo in Folsom, California was different. And it is, in some ways. The animals are all rescues. They are neutered. No animal is sold or bred or traded to other zoos. While the habitats are all pretty small, they are set up for the animals convenience, not ours. Animals can go inside during visitor hours, so they don't always have to be on display. Downside? Enclosures are small. You just cannot provide enough room for tigers, wolves, coyotes, bears and mountain lions (even worse, three mountain lions were housed in the same enclosure). The coyotes were exhibiting abnormal, stereotypic behaviors. So was the grey squirrel. The bears and two tigers seemed relaxed, and they are expanding the wolf enclosure soon. The hoofstock had plenty of room to roam, which was nice. 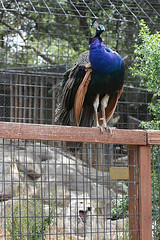 The feral peacocks and chickens had it best with access to the entire park (all enclosures have netting on the top to prevent escapes and entrances from wild/feral animals). The other downside, as always, is the people. One man took it upon himself to growl continuously at the mountain lion, a female who was growling back and upset. I told him to stop it and he did but only momentarily. It was in that moment when I wished I could transport him into that lion's cage and ask him to growl for us. 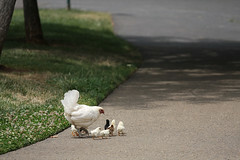 Another woman tried to chase down a hen and her chicks so that she could grab a chick for her baby to see. I yelled at her and she stopped. I was embarrassed for her, really, a grown woman chasing down a baby bird for what? I mean, really. 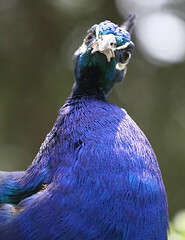 Anyways, I could not get any great pictures of the animals in their enclosures, but I did get some good pictures of a feral peacock and one shot of the hen and her clutch. dude, what's the mental age of the guy growling at the lion? seriously. Kudos to you for speaking up for those poor critters. Chasing down a chick? Ugh. What a vile person. I live next to the National Zoo in DC - (so close that I can hear the monkeys when the weather conditions are perfect) - which puts me in the receiving line for visiting friends and family; however, I have yet to accompany a single one to the zoo and tend to get a bit of crap for my refusal. Grr. i hate zoos too. they make me cry. something i'd have liked to say to the growly man... "oh wow, you're real tough to be growling at a caged animal who cant do anything about it. i bet you feel superior."